The familiar is present within my life in Amsterdam. And yet I must remember to remind myself that the familiar, now, was once not. Life is all about perspective, and the ways in which one chooses to perceive. There are some days, such as today, when something within the city's air transports me back to my first few weeks in Amsterdam, six years ago. Hopelessly lost deep within this city, in every possible sense of the word, I was determined at that time to make it mine. With a knowledge of about, oh, two words of Dutch, a bike that had seen better days, and a new wardrobe that I had only a few weeks before purchased in the USA (whose efficacy in buttressing my transfiguration into a full-fledged European upon arrival I never questioned), I arrived. That wardrobe was supposed to, in my mind, allow me to blend in while still not truly belonging to this new place I chose to call my new home; it wrapped me with a chameleon-like skin, which allowed me to adapt to the social situations of varying intensity that I was then immersing myself within. It was perplexing, confusing, exciting, unfamiliar, and (as this blog has allowed me to capture) full of ephemeral emotions. 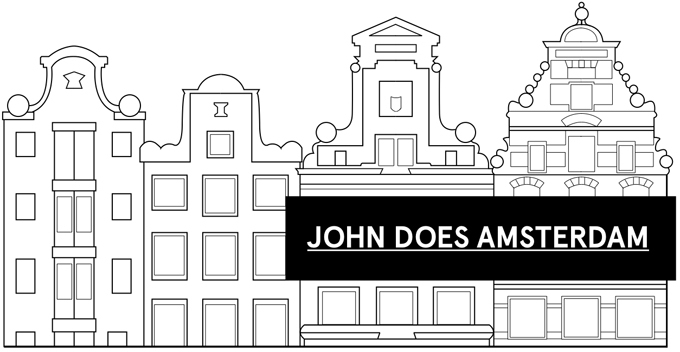 It's rare that such moments, like those of today, trigger such intense bursts of Amsterdam déjà vu, and I specify, as I must also not forget that I have a history before Amsterdam–a good one, too. Yet when these familiar-inducing moments do present themselves, I savor them with the utmost delight. Sometimes, when I cycle through the Oud Zuid, near Olympiaplein, a certain tree–which I have yet to designate–disperses a scent that spills throughout the whole of that neighborhood; it's one of the most distinctive scents of Amsterdam and it also reminds me of my first year in the city–as the Oud Zuid was where I then lived. Just this afternoon, I consciously noticed another, new scent, encircling the rear garden of the Rijksmuseum. This scent–whose source I also have yet to find–is different than that of the Oud Zuid's, yet unique it is. This multitude of scents, sights, sounds; they're everywhere. And they all affect my perception and experience, which are–I should remind myself–only two ways of taking note of the world around me. Yet both amplify its pleasures, and, it would seem, also weave themselves into my memories. And so words, or conversations, constitute only one way of remembering the past. And as I go forward, in Amsterdam and in life, I'm beginning to see the world from a new perspective. 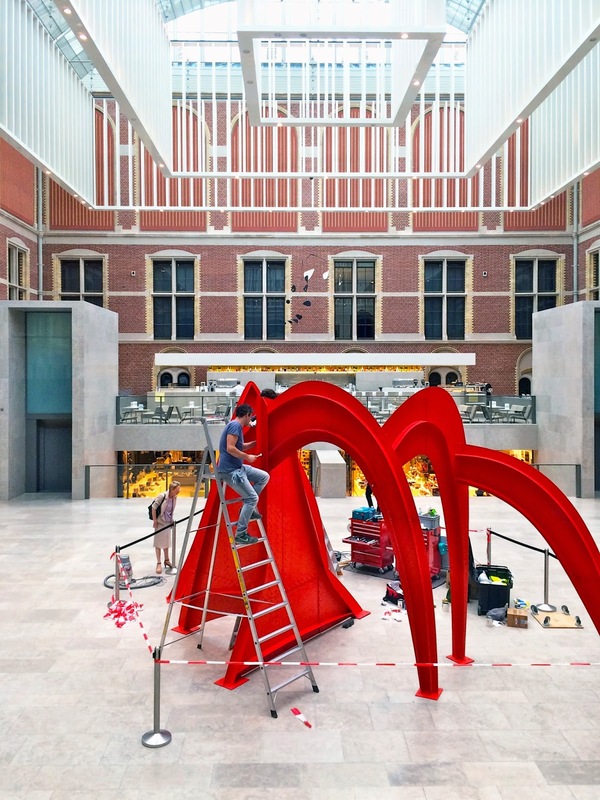 Not a forced perspective, and not a foreshortened component of a larger perspective, but instead an entirely new way of looking. Even though the Rijksmuseum and I have seen more of one another than I could have ever anticipated, and even though countless books, lectures, and literature have enriched my many experiences while there, I could have never anticipated the seminal impact that the content housed within its structure–which could also be called its 'insistence' (thank you, Esther Pasztory and Gertrude Stein)–would have on my life. 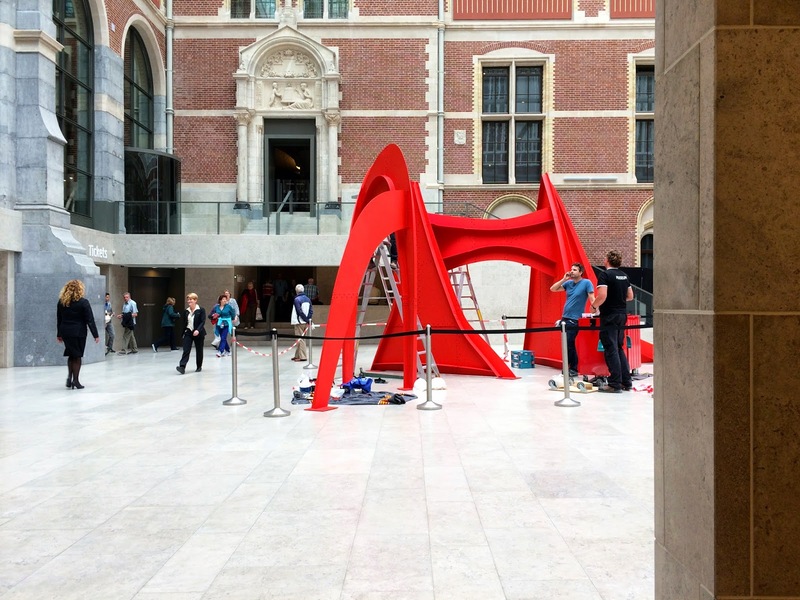 Today and yesterday, while visiting the Rijksmuseum, I took note of a series of sculptures and mobiles–by Alexander Calder–that are now being installed in its foyer and throughout its gardens. Even though I had seen this garden countless times before, it now presented me with something new; an intervention within and around the museum has changed the ways in which it can now be perceived. Only today did I realize what it is I've been doing, exactly, since September of last year: I'm teaching myself to see the world, and its 'art', from a whole new perspective.